Gujarati cuisine is from Northwestern part of India from region of Gujarat. 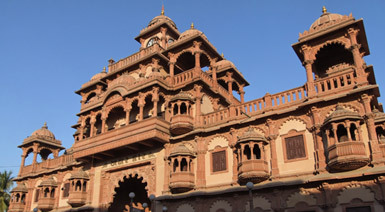 Gujarati food is primarily dominated with array of vegetarian dishes. Gujarati food has its unique blend of sweet and spicy flavors. 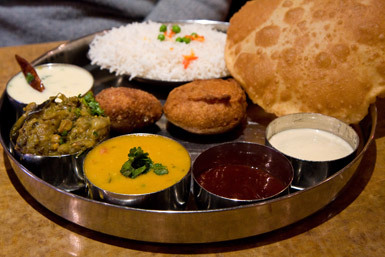 Gujarati dishes are traditionally served on silver platters with both rice, breads and plethora of vegetarian dishes. Vegetarian dishes use regular curry spices but leave a sweet after-taste. Some of Gujarati food include: Khandvi, Dhokla, Patra, Khaman, Kachumbar,Dal Kadhi, Dal Dhokli, etc. The desserts includes famous shrikand, a creamy thick saffron spiced yogurt. Other famous desserts are Basundi, Malpua, Ghari etc.